Don’t cry, kid! It really is Iron Man. When Jaxson Denno’s mom heard that Robert Downey Jr was shooting his new film nearby, she promised her son he was going to get to meet Iron Man. When Downey came out to great them, sans superhero get up, Jaxson was inconsolable, but not in a good way. RDJ is currently hanging out in Sunderland and Shelburne Falls, Massachusetts as he shooting his film The Judge. The one day that he doesn’t fly to work in costume just happened to be the day Jaxson and his mom came to visit. Darn. The actor consoled the distraught 1 1/2-year-old boy while his mom snapped a concerned shot. She told People that Jaxson “was so confused because I kept telling him it was Iron Man and he knew it wasn’t…Iron Man in the suit.” She added, “He was fine as soon as he talked to him. 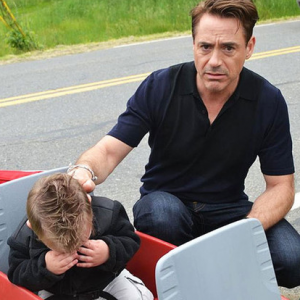 The way Jaxson feels in the picture is exactly how we all feel since RDJ hasn’t officially signed on to The Avengers 2 yet. He still has a little time, but he’s really cutting it close. Iron Man 3 brought in $1.2 billion worldwide, according to E! News. Joss Whedon, director of The Avengers and The Avengers 2, said he won’t make the movie without Downey. Ya hear that, RDJ? Time to make the call and sign on, dude! !